Dubai, UAE, March 23, 2019: Manzar creates couture in its truest sense; luxuriously crafted, wonderfully detailed and tailored to perfection. On any occasion from your red carpet day to an evening about town you dazzle in an original creation. At MANZAR we give shape to a distinct style in couture that is a unique blend of classic embroidery, textures, drapes all brought to life with an original and modern sensibility. Our Designs have a strong personal identity, drawing inspiration from MANZAR’s personal vision and caters to the needs and lifestyles of our patrons. MANZAR enjoys working on themes to take the concept of “one of a kind” to a new level. We have undertaken commissions to customize wardrobes for specific events, occasions and celebrations and endeavor to fulfill the constantly varying and invigorating needs of our patrons. 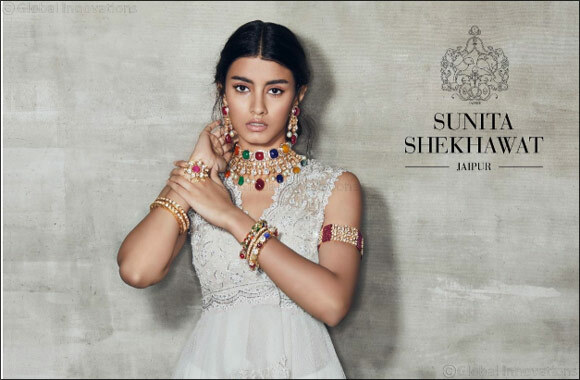 Sunita Shekhawat is a heritage fine jewelry brand that creates timeless masterpieces based on the traditional art of Meenakari with a fresh and contemporary aesthetic. For over 25 years, academic curiosity and experimentation with handcraftsmanship has influenced the brand’s design philosophy and developed its distinctive aesthetic. The brand is noted for its amalgamation of unusual colour palettes and interpretations of fresco motifs and architectural shapes from different regions within India. Sunita Shekhawat, as a designer is recognized nationally as well as globally as an upholder of the legacy of Meenakari art form. During the journey, our clientele spans across geographies – from the royalty of India to celebrities, and fashion personalities. Some of them include – Princess Diya Kumari of Jaipur, Her Highness Maharanisa Hemlata Rajye of Jodhpur, and many more.